Skin cancer is the most common form of cancer in the United States, with more than 5 million new cases reported each year — and the incidence is rising faster than any other type of cancer. At Dermatology Consultants of Gloucester in Gloucester, Virginia, Dr. Timothy Gardner can diagnose and successfully treat all types of skin cancer, including basal cell carcinoma, squamous cell carcinoma, and melanoma. To schedule a skin cancer evaluation, call the practice or use the online booking agent. The primary cause of skin cancer is ultraviolet radiation, mostly from the sun, but also from artificial sources like tanning booths. About 80% of skin cancers appear on the face, head, or neck. The most common type of skin cancer is basal cell carcinoma, comprising 80% of all skin cancers. It’s also the least dangerous because it grows slowly. Though rarely life-threatening, when left untreated it can grow deep beneath the skin and into the underlying tissue and bone, causing serious damage. This is the second most frequent skin cancer, accounting for 15% of all cases. Squamous cell carcinoma most commonly develops on the lips, face, or ears. While squamous cell carcinoma tends to grow slowly and is easily treated, it can become aggressive and spread to the lymph nodes and internal organs, making it life-threatening if left untreated. 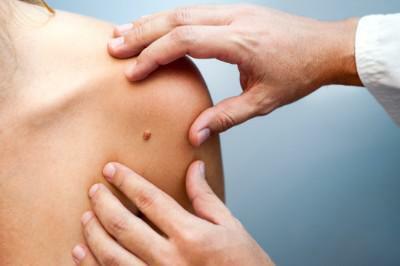 The least prevalent but deadliest form of cancer is malignant melanoma, which accounts for 4-5% of skin cancers. If discovered and treated early, it can be completely cured, but if it’s not treated quickly, it may spread throughout the body and is often deadly. Basal and squamous cell carcinomas can vary widely in appearance. The cancer may begin as small, white or pink nodules or bumps, or it may be smooth and shiny, waxy, or pitted on the surface. It can also appear as a red spot that’s rough, dry, or scaly; a firm, red lump that may form a crust; a crusted group of nodules; a sore that bleeds or doesn’t heal after two to four weeks; a white patch that looks like scar tissue. The best skin cancer prevention is to know your skin and examine it regularly, from the top of your head to the soles of your feet. (Don’t forget your back.) If you notice any unusual changes on any part of your body, contact Dermatology Consultants of Gloucester so Dr. Gardner can check it out. What other skin growths should I be on the lookout for? Moles are clusters of heavily pigmented skin cells, either flat or raised above the skin surface. Most are harmless; some may develop into malignant melanoma. Solar or actinic keratoses are rough, red or brown, scaly patches on the skin that usually form on areas exposed to the sun. While only 10% of actinic keratoses progress to become squamous cell cancer, the majority of squamous cell carcinomas develop from actinic keratoses, so it’s essential to have these skin patches examined regularly. At Dermatology Consultants of Gloucester, Dr. Gardner diagnoses skin cancer with a biopsy, in which all or part of the growth is removed and examined under a microscope. Treatment depends on the type of cancer, its stage of growth, and its location on your body. Malignant tissue is scraped from healthy tissue with a sharp instrument called a curette, a process that’s effective for small, superficial, and previously untreated skin cancer. The skin cancer is excised in an elliptical fashion and closed with stitches. The specimen is sent to the laboratory to check margins to be sure all the cancer was removed. Chemotherapy and immune response modifiers can be applied topically to non-dangerous cancers to stop cancer growth or stimulate the immune system to attack the cancerous cells. The most precise method for treating skin cancer, Mohs offers the highest cure rate while removing the least amount of tissue and causing minimal scarring. It is a very popular option for skin cancer on the face. This is a non-surgical treatment for basal cell and squamous cell carcinomas (non-melanoma skin cancers). It offers an option for some patients when surgical intervention is declined, unadvisable, or potentially associated with significant cosmetic or functional limitations. Used for some melanomas, which have a higher chance of spreading, so an additional margin of surrounding skin is removed depending on the depth of invasion. Contact Dermatology Consultants of Gloucester today to schedule a skin cancer check-up. You can book your appointment online or over the phone.